Ever since I was a child I have loved art. My mother was an artist and just as soon as my brother Bruce and I could hold a pencil she started us drawing. At age three I drew an elephant and at age five I drew a girl. I have these saved in my scrap book. No coloring books were ever allowed – just plain pieces of paper. I would draw girls, clothes, and designs, and my brother, Bruce, would draw cars, airplanes, etc. and listen to the radio. This would happen every single day. Mother would have us always look around us at the beauty of the world especially if we were traveling. It was important to be aware of God’s amazing scenery. I have done this all my life and strive to put this beauty down on canvas. I didn’t take art in school, but would just always draw or doodle on my school papers. After homework was done, I would listen to the radio and draw. It was a good pastime. During my early married life, I had a great time designing ﬂoats and county fair booths. Later, I was fortunate to have two jobs I especially enjoyed. They were at ZCMI managing and decorating the giﬁ department, and Keep Sake Kottage — full of gifts and beautiful items to arrange for display. 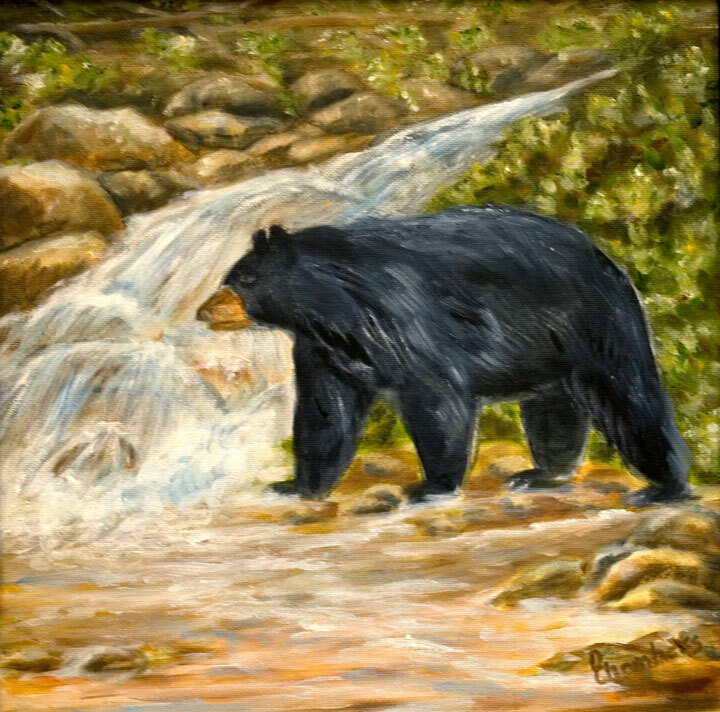 With my family and involvement in the Cub Scouting Program, I put my passion for painting on hold for a short time, and then later in life went forward with excitement and zeal. A group of us art lovers got together each Tuesday and would paint from 9:00 till noon. As we had no teacher, we would critique each others work. We have done this for years and years at the Cache County school district offices Sun room in North Logan, Utah. We all have the same passion and have enjoyed our time together. They all are amazed at how quickly I can ﬁnish a painting. Yes, I paint rather quickly. I feel blessed to do something I love so much and doubly blessed that others like it too. Since my husband, Garth passed, it has become my therapy. I paint everything and anything; not everything is spectacular, but I have a good time. When grandsons are awarded their Eagle Scout award, I paint them an Eagle. 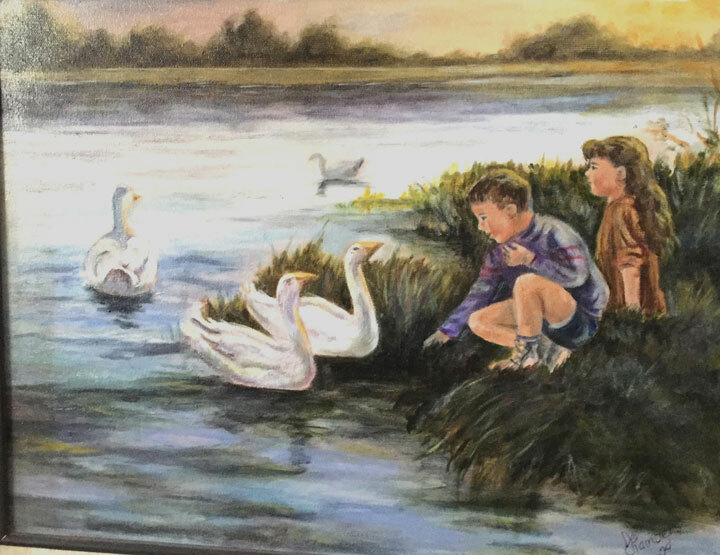 When grandchildren graduate from high school, they select a picture and I paint it for them. When a new baby arrives, how fun to create a fun picture for their room. 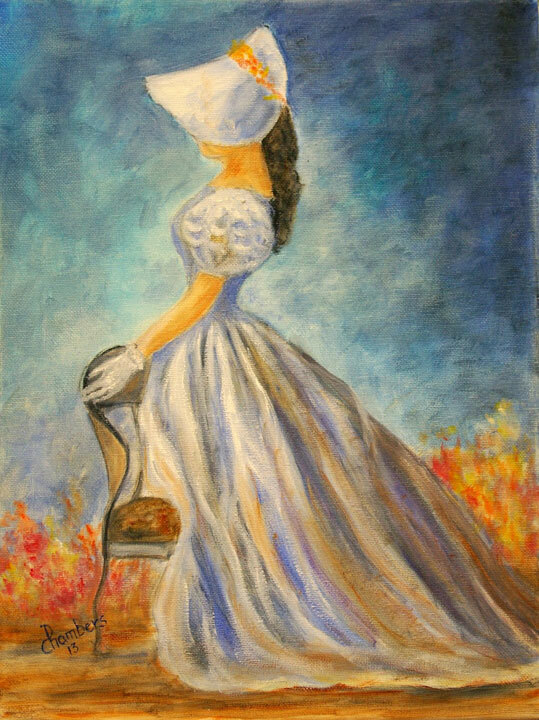 When there is a marriage -—- I present a gift of a painting. Family always sends me beautiful pictures from their travels for me to paint, which I enjoy doing. 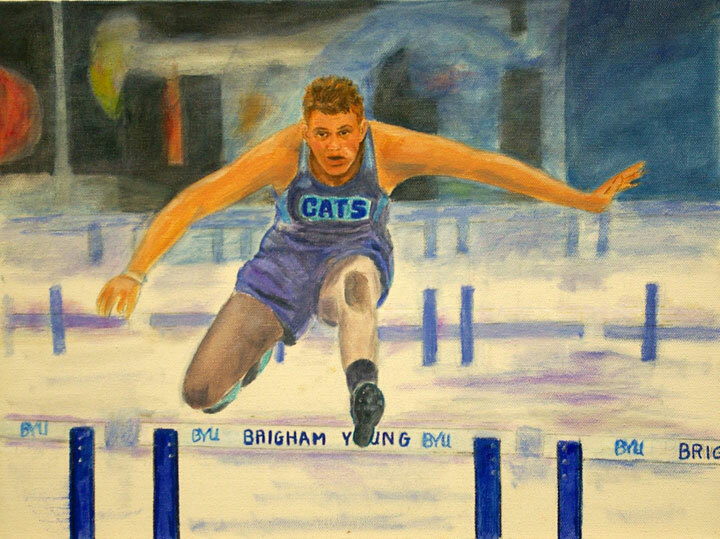 While serving as Mormon Church missionaries, my husband and I would take pictures and paint them when arriving home – Finland and New Zealand were the perfect places for this to happen. I currently have a painting displayed in the Lewiston City office and one painting of the ﬁrst ZCMI store ﬁrst located there in the Lewiston Library, Currently I have one painting at the Logan art gallery and two at theTrapper Trails Scout Office in Logan. I have had many alt shows where my paintings have been displayed. I have entered several art competitions and have received high awards, but this hasn’t been much of a desire for recognition. —- thank you notes, happy birthday, sympathy, thinking of you, and congratulations. This has been fun. I have taken a picture of each painting I have completed. I enjoy glancing through them and reminiscing of the, at least 150 +, I have photographed. It is a real treasure and a happy reminder. To me painting is much more than a hobby, it is an important part of my life. I feel my family and friends have felt the love through each of my paintings given them. I thank my Father in Heaven and mother each day for the talent I have developed to bless my life and the lives of family and friends.